Speak to Tailoring Master, and accept the invite to practice some Tailoring. Speak to her again and she will inform you of some work orders. Since this is also crafting, you complete these work order and gain skill levels by crafting the items for the work order. When accepting a work order, it tells you the items required to fill it. Keep repeating the process of crafting items for the order until you reach a 5 level marker. Every 5 Skill Levels will make the master give you a new work order. For information on what work orders are for what skill level, see the table below. Speak to the Tailoring Loom in the same area, and sell it items required for the crafted product. each time you craft items, you earn experience for your skill level. 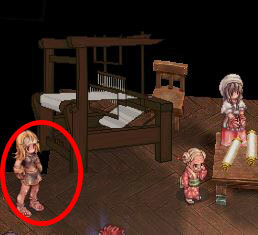 After creating the items, you can return to the Tailoring Master who will give you experience for the work order. Repeat the process of obtaining work orders, leveling, and crafting to advance in your craft. At any point, you may start crafting weapons and/or armors. The higher level you are in a craft, the better success chance you will have, so if you are level 10, you will have close to no chance at succeeding in making a "Cashmere" level item. For a list of items you can forge that are non-work order crafts, see below under book crafting and weapon/equipment crafting. You need a new Tailoring Guide every 10 level to continue leveling your tailoring skill. Intermediate at 10, Advanced at 20, and Journeymen's at 30 respectively. You can buy Tailoring Guides from the Tailoring Shop. You can also buy an Artisan's Charm to increase your crafting success. The special costume is made from Phoenix Hair. You can trade or vend this item. A long hat modeled after the shape of monster Whisper. A feather of angle that decorated into a costume, designed for Royal Guard. Add 10% additional damage to Demon monster. Named after an ancient fire bringer, this crown is imbued with the power of eternal flame.? Add 2% resistance from demi human attack. Additional 2% damage to demi human.